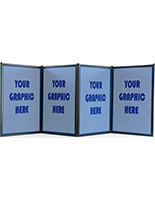 Your company has a trade show booth at the next convention. 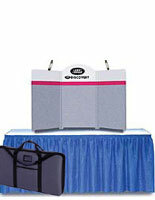 What kind of exhibition tools will you need? 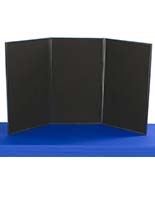 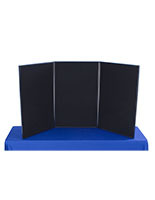 Folding display boards are an excellent choice for many reasons. 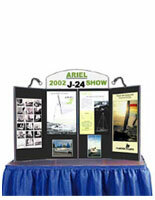 Having the biggest and most extravagant attractions at the show isn't the most important part of the experience. 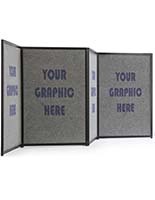 With folding display boards, getting the word out to potential customers is an affordable yet direct way to engage viewers with your company information and product lines. 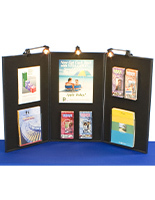 These exhibition stands feature colorful fabric choices, lighting options, and acrylic accessories for holding your brochures. 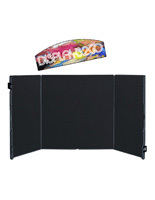 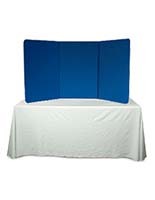 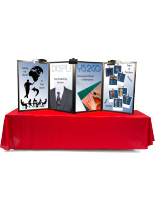 Moreover, our portable folding display boards are easy to transport and built to last. 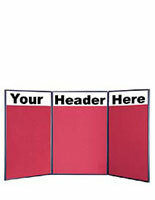 These are not your cardboard presentation boards students buy for their school projects. 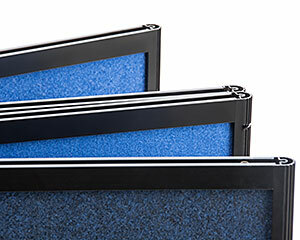 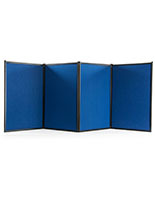 Each panel is fabricated with a plastic frame that's covered with a velcro receptive fabric. 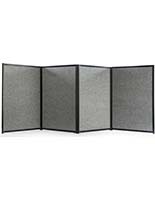 The tri-fold panels are hinged together and, once folded, fit into their very own canvas carrying bag. 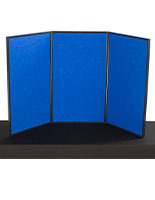 What options are available on these tabletop presentation stands? 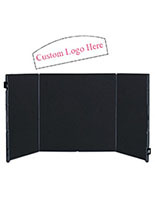 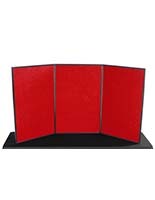 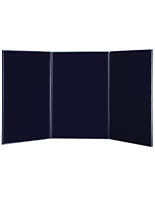 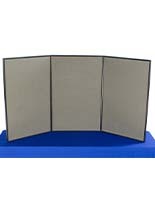 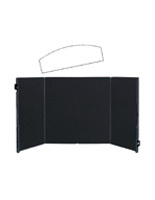 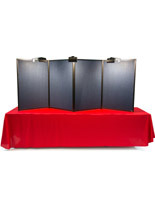 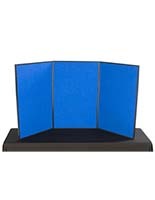 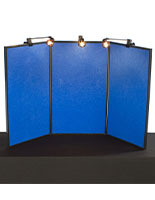 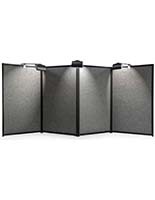 The folding display boards come in three or four-panel models. 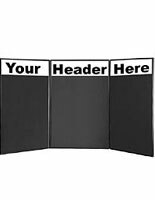 Tri-fold styles are the more popular of the two, but if you have a sizeable amount to display then we recommend a four-panel version. 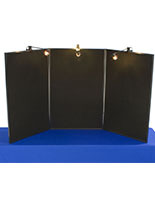 Gooseneck lights that clamp on at the top come standard with certain models. 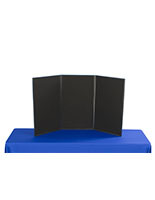 However, they can be purchased separately as an add-on accessory. 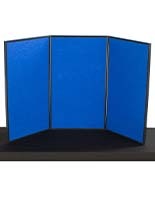 One of the best things about these portable exhibition stands are their color offerings. 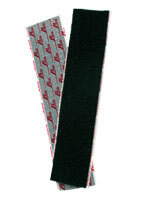 Choose your fabric color in black, gray, blue, or red. 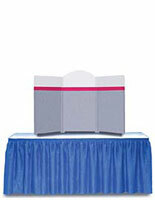 If you plan to place the display on a table that has a fabric cover, make sure your color choice is compatible. 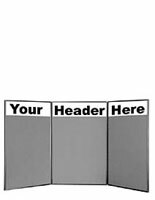 Some stands feature custom headers at the top of the boards. 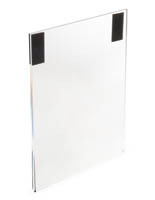 This is an excellent accessory for your overall presentation. 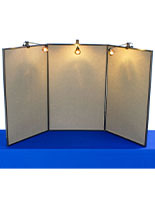 At a glance, viewers will know who you are and what you are selling. 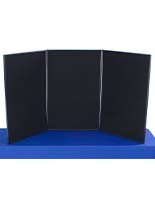 What good are table top presentation stands without something to display? 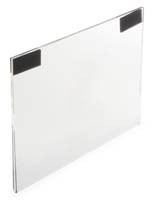 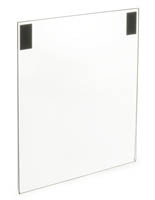 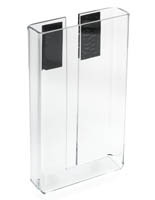 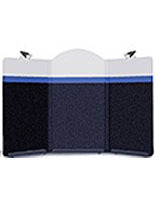 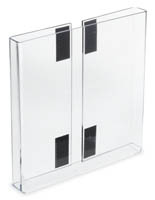 Showcase signs, posters, brochures, and catalogs with our selection of acrylic holders and pockets. 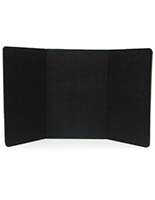 These inexpensive accessories all come with velcro strips already attached to the back that adhere to the boards' fabric surface. 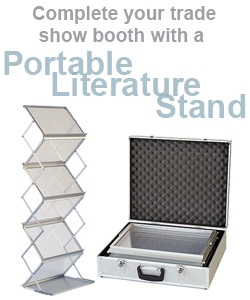 Portability is always a concern for exhibitors. Most of these models simply fold down and fit into their own carrying bag. 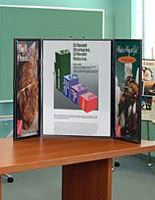 More expensive tri-fold displays become self-contained like carrying a briefcase. 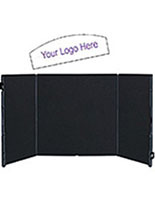 The sides fold in from each side thereby reducing its overall size by half. 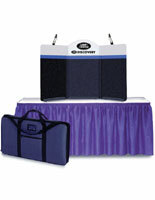 Convenient integrated handles remove the need for bags as the unit becomes the bag itself! 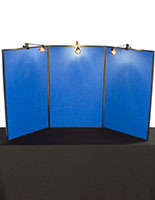 The one thing all styles have in common is their quality assurance. 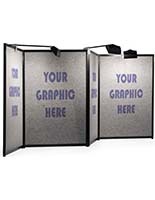 Unlike cheap cardboard stands, these trade show tools are designed to last for many years of use. 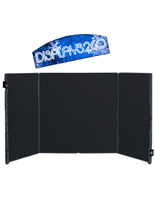 Their flexibility is part of what makes these displays so appealing. 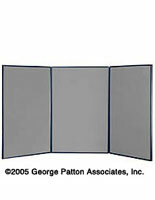 Change up the presentation as you see fit, add more brochure pockets or sign frames when needed. 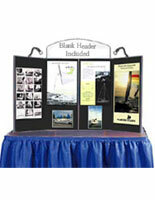 Each new event can feature a brand new design that's tailor-made to the project at hand!